This game is about building shapes. The first person to complete a shape wins the round. They first person to accumulate 500 points wins the game. Each player decides what shape they wish to build. Each shape must contain at least 3 connectors and one color of rod. Each player may use a maximum of 7 rods and/or connectors of any type. Each player must share their shape design at the beginning of the game. All players work together to decide on the value for the connectors and rods. The players play a maximum of 4 rounds, the winner is first player to get 500 points or the player with the most points after 4 rounds. If a player runs out of the materials required to build their model they are awarded 25 points. The second player to run out of materials earns 50 points. Every player that uses 3 separate items in their model successfully they earn an addi- tional 50 points. Every player that successful- ly uses 4 separate items earns an additional 75 points. 1. Each player creates their shape, draw it out on their sheet, then disassemble it and return your pieces to the center. 2. Players decide what type of math problems they will do, addition and subtraction or multiplication and division. 3. Players may decide together the values of each colored rod and connector, or they may roll a die to determine these values. These values are writ- ten down on the worksheet. 4. Players share their shape design before the game begins. 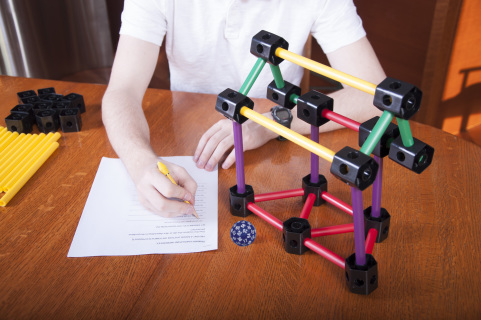 Players should write down the color of the rods and type of connectors that they will be using to complete their shape. 1. The first player rolls the die, either the 12 sided or 60 sided depending on the math level of the players. 2. Using the number that they rolled and the value of the connector or rod the player must make and solve a math problem. If they are able to do so they may place the manipulative in their model. If player does not correctly solve the math problem, they do not get item. Move to next player. 3. The round continues until all players complete their shape designs or run out of materials. 4. Players calculate their score at the end of the round and record it on their worksheet. 5. Players play up to 4 rounds or until one player scores 500 points. THATS IT! ITS EASY TO PLAY AND HOURS OF FUN. An exciting construction kit encouraging creativity, construction and challenges using the exercise book for ideas. You can also create the problems and challenge your friends to math solutions by creating construction problems linked to what you have created.